correctly reported in a newspaper"
Risen dramatically, you say? Oh dear. 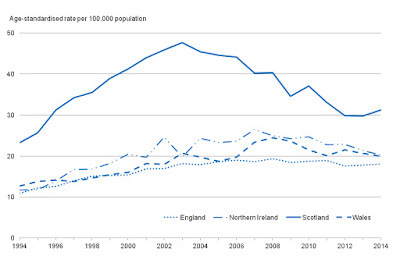 Scotland is the top line: the one that's been going down while all the other ones have been flat or rising; the one that saw the rate of alcohol-related deaths fall from nearly 50 per 100,000 to barely 30 per 100,000 since 2003. 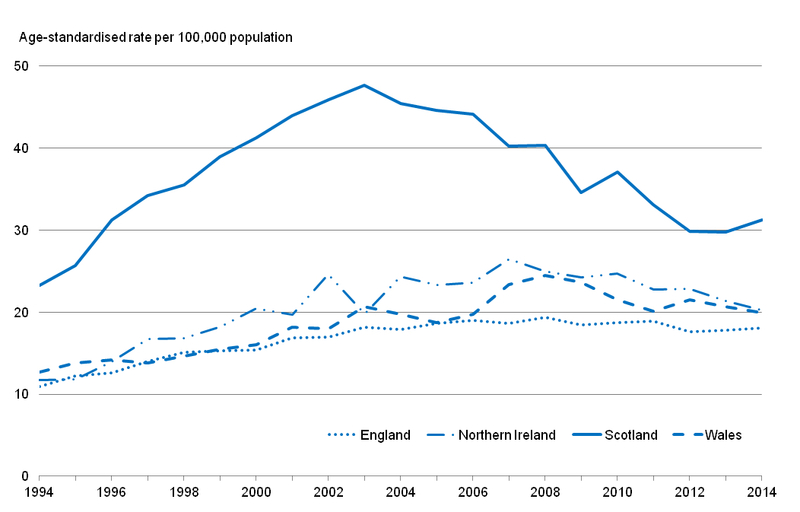 Does Scotland have the highest rate of alcohol deaths in the UK? Yes. It has for decades. Has this rate 'risen dramatically'? Once upon a time, yes - as it did in all the other home nations - but the story of the last thirteen years has been steep decline, in contrast to England, Wales and Northern Ireland. How strange that the Scotsman is still reporting a rise in alcohol-related deaths that came to an end in 2003 while ignoring the 33 per cent decline that has taken place since. Is this a newspaper or a historical journal? It's almost as if there's a fixed narrative that no amount of facts can shift, isn't it?